Located in the northwest corner of Georgia near Hwy 113 and Hwy 101, our farm is rolling pasture interspersed with pine stands. Call or come by to talk goat. You can choose replacements for your current herd or get started with your first. 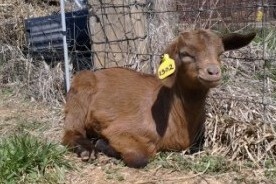 We have been raising goats since 2000 and are very pleased with the hardiness and performance of the Kiko breed. There have been other breeds here, but they are long gone. Making the most on small acreage, the focus is on quality, registered seed stock. Performance data is collected and analyzed on all goats. Kids that don't make the grade are culled to the BBQ market. Does are retained based on their kid weaning weights and easy upkeep. That data is available to the buyer so they can make an educated purchase. A 100% Kiko sire and "upwardly mobile" percentage Kiko does grace the breeding program. (Does currently range from 3/4 to 31/32.) We are moving to all 100% Kiko does to meet the demand for seed stock for this hardy breed. Our goats are rotated through 20 acres of fescue/clover mix pasture with hay and protein supplement tubs for winter. Free choice mineral supplement is available year round. Some pastures are being overseeded with either sericea lespedeza or a grazing millet hybrid to reduce parasites and overcome dry condition challenges. 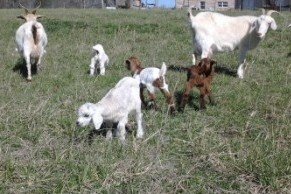 We grow forage, manage parasites... and also raise a few goats.